I’ve been having a bit of a think lately, and a bit of a read, well actually quite a bit of a read. I’ve been reading a lot about how the materials we select for our children and the way we offer them reflect our view of children. What do we believe to be true about children? What do we expect from them? And how is this reflected in the materials and types of activities we offer them? We have such a profound influence on our children; how we view them really can limit or enhance them. Sometimes (or more often than not) our view of children is cultural, societal, unconscious. But it is reflected in the way we act towards our children, how we speak to them, what experiences we offer them. 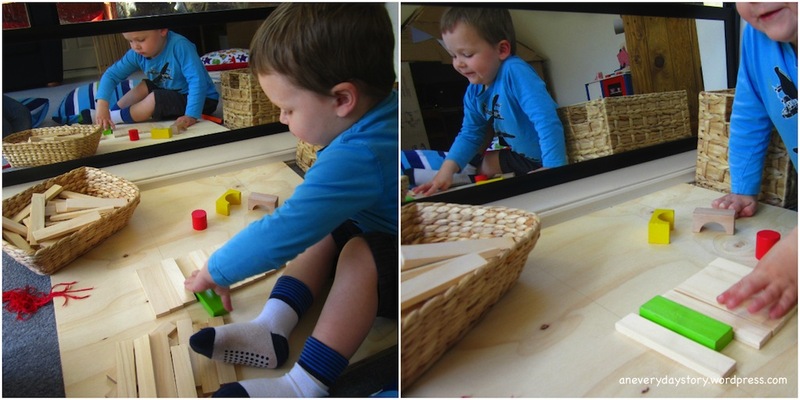 I believe my children to be capable, to be able to create their own play, to have enough innate inquisitiveness to not require overstimulating toys, preferring instead open-ended toys which appeal to their developing senses and need for sensory exploration. However as I was having a look around the playroom, I realised that, while I like the room, what I thought was my view of my children wasn’t being shown as clearly as I would have liked. The room needs to evolve, to change with them, to continue to challenge and inspire them. They are worthy of this. So, I had a bit of a think and moved things around a little bit. I was particularly thinking about the blocks. Everyone has blocks. But what are our expectations of blocks? How do we expect children to use them? Ours were just in a basket and no real attention given to them. 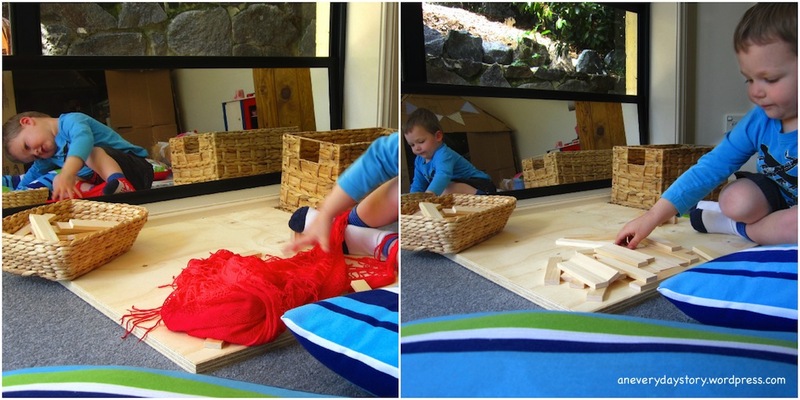 When I was thinking about the playroom as a space for Jack (3.5yrs) and Sarah (16mths) to play and learn and build on their skills, extend their knowledge, their imagination, I thought about presenting things differently to encourage them to play with familiar materials in different ways. This was more in tune with my view of them, inquisitive with a deep desire to know, to understand, to learn. It’s a small change, but I think this new block corner encourages them to engage, to build, to create. The mirror offers a different perspective to challenge their thinking, and the platform gives them a nice sturdy surface to build. I also put out the Duplo blocks and board next to the natural blocks. I moved the tinker-table outside (this is where I intended it to go anyway) so we can use it for nice messy endeavours. I moved the books into the shelves and put the floor cushions near the block area to encourage Jack and Sarah to sit and stay a while. This is what we have on the shelves at the moment. I usually rotate them every few weeks depending on the kids’ interests, but today I added the vase. I really love fresh flowers and these native Proteas are just gorgeous. I thought Jack and Sarah would enjoy them too. 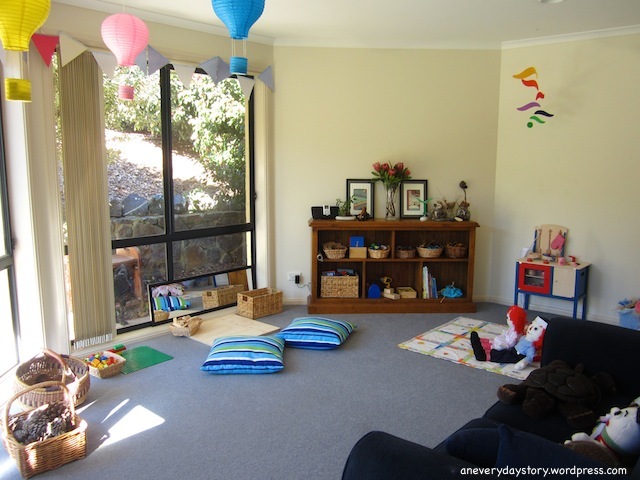 So a few little changes to the playroom, making it, I think, a more inspiring environment for Jack and Sarah. I’m looking forward to tackling our outdoor play area, that is one space which definitely needs a dose of inspiration. I love your new block corner (and your whole room actually!). Never thought of using a board for stability, might try that in our front room. Off to Bunnings to buy one tomorrow! This is probably the most basic of steps needed to create an environment in which the children can experience success in building – can’t believe I haven’t had the presence of mind to do this until now. Thanks for the great idea and the lovely sticky-beak into your beautiful home. The room is beautiful! 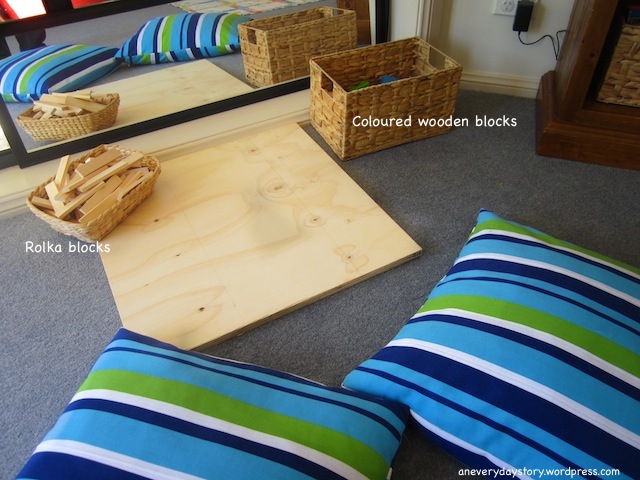 I really like the idea of placing a board down on the floor as a flat surface. I think I may have to do that! Awww nice work Hubby! They are gorgeous aren’t they? And they last for weeks. I may be a little biased but I think we have some of the most beautiful native flowers down here. I wonder if the mirror you used in this room also an acrylic one? I am thinking to set up one for my kids too. How do you stabilize it? Thank you. I am enjoying reading your blog. Hi Sheau, the mirror isn’t acrylic, it’s glass. I stabilised it with some blu-tac onto the window. I’m not concerned though with Jack or Sarah leaning up against it or breaking it, they are used to having mirrors around and while they interact with them, they don’t tend to touch the big ones. Jack knows that he needs to be careful because it could break and Sarah is learning. Katie I got ours from Wood Puzzles. They are in Qld. 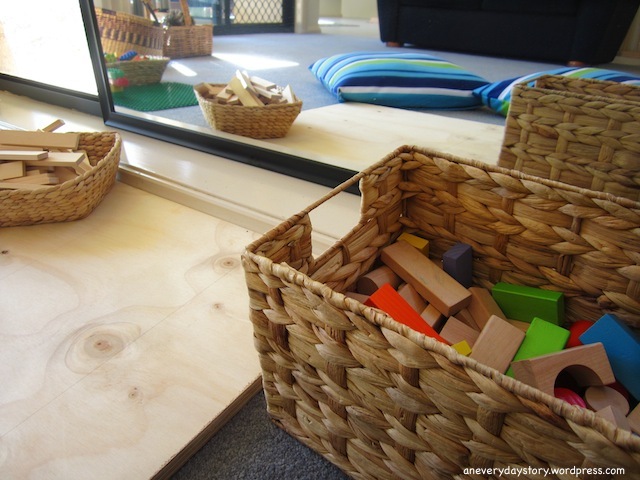 http://www.woodpuzzles.com.au/c/188751/1/montessori-.html . They are handmade and quite good quality. I also got the sandpaper numbers, numbers & counters and the moveable alphabet. The prices aren’t too bad. The sandpaper isn’t too rough, just rough enough to send a nice sensory message. Jack really enjoys the feel of the letters and likes to trace each with his finger. Sometimes we do one at a time, sometimes we run through the whole alphabet, sometimes Jack wants to know a specific letter so we will look for that one. There is a recommended order to present the letters but I find it better to follow Jack’s interests and go with the letters he wants. E is getting really interested in letters, numbers and writing. I noticed that you had sandpaper letters, how do you use these with J? Do you have any other suggestions? We love the sandpaper letters. Jack uses them most days. I started out just introducing a few letters but then when he knew all the letters I just put out the whole set. He likes tracing the letter with his fingers and laying them all out on the floor. Sometimes when he is asking about a letter we’ll get it out of the set and he practice tracing or writing it. Have you tried a sand tray with E? Just a shallow tray with some sand in it. You can get out a letter and she can draw it in the sand with her finger. We just started with some squiggles, zig-zags and curves (you know the shapes in letters). Jack also likes shaving cream, coloured salt, those gel sensory bags, that sort of thing. He uses his finger to write letters and draw pictures. Hi there thanks for the chance to “visit” – can you tell me where you got the felt magnetic fishing set from? I love your website! My name is Debbie, and will be teaching a kindergarten/grade 1 class in the fall, and have begun reading and researching the Reggio approach daily. I was thinking of bringing in some toys my kids don’t play with anymore; do commercial toys have a place in a Reggio inspired classroom? I noticed and loved your own little bookcase display of items-I have lots of duplo, mr potato head, tinker toys, toy cars, etc…..
Hi Debbie. From my experience, more open-ended toys are favoured over commercial (branded like Disney or Pixar) toys. Having said that though, it really comes down to how the toys are arranged and what other materials are offered alongside. I think what’s important is not whether a toy is branded or not but whether the child has shown an interest in a particular theme or topic and then what toys and materials are made available to the child in order for them to extend that interest further through play. 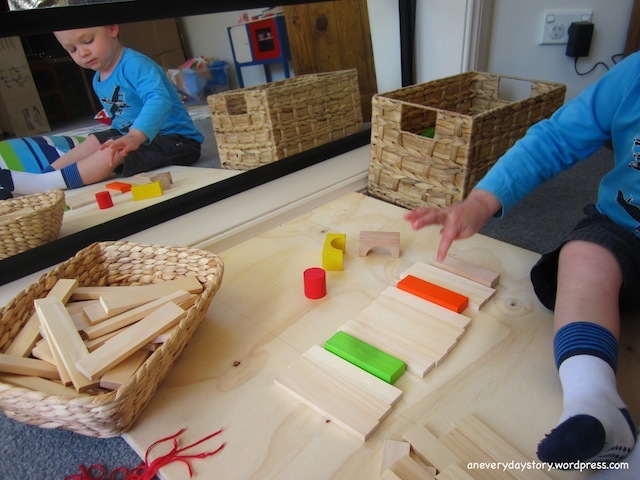 Also if the toy encourages the child to sit while it does something (lights,noise,movement) then there are probably other toys or materials you could choose which would encourage the child to engage and explore more creatively. With the toy cars, you could include other materials to encourage children to create their own play. You could include some large blocks or some timber off-cuts for ramps and bridges, you could include some fabric scraps for water of grassy fields or some sticks and rocks for trees and things. Do you think you might be able to visit the kindergarten/grade 1 class and observe some of the children to get an idea of what interests them at the moment? Or maybe speak with the teachers about some of the games they have noticed the children playing lately? This is the best possible starting point, if you cater your activities or explorations to the children’s interests it’s hard to go wrong. 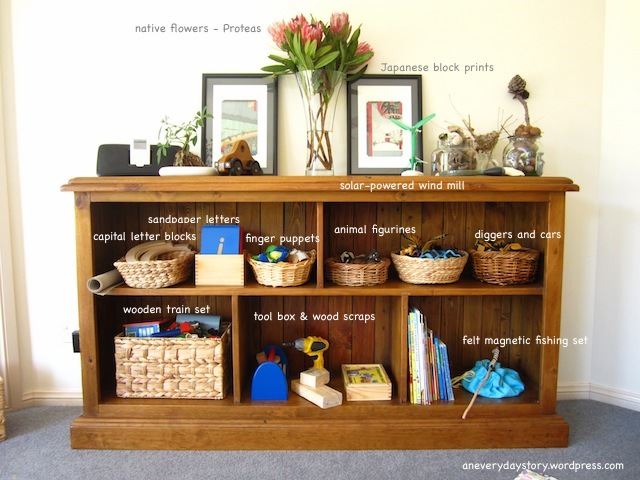 Is this school a Reggio-inspired school or are you hoping to introduce some of these principles when your start? Hi. Thank you 🙂 Ours was an off-cut of timber. Since it was on the floor, we weren’t worried about sharp corners. If you are concerned though, you could easily sand the edges to make them smoother.